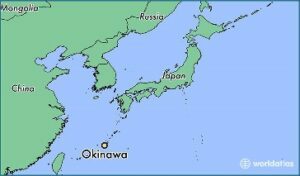 It may sound odd to say Okinawa is a good place to start playing ice hockey, but there are a bunch of stick-wielding, puck-slapping players on the island who would disagree. Although Neil grew up in Canada, he only played field hockey as a youth. The first place he laced up his skates to play hockey was on this subtropical island. Neil and other members play regularly at the Sports World Southern Hill in Haebaru Town. The relationship reaches well beyond international borders. 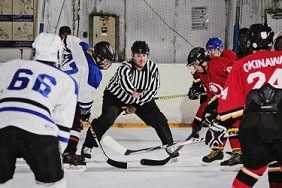 Just recently, the inaugural Ryukyu International Ice Hockey Tournament was held at the rink, bringing five teams from Okinawa, South Korea and Thailand together for a weekend of competition. The SniperZ was a driving force to launch the tournament. The tournament literally brought people from remote corners of the world to the island. Joe DeBlois from Portland, Oregon, was at the rink to root for his son who was playing for the Korean team. And if the players on SniperZ had their way, there will be more to watch in the near future. Although the tournament was meant to be a friendship game, heated competitions were often played out on the rink. But once the tapped their sticks on the ice to end a game, they had big smiles on their faces. Neil, who is expecting more people to join the club, says it’s all about getting on the rink and enjoying yourself.